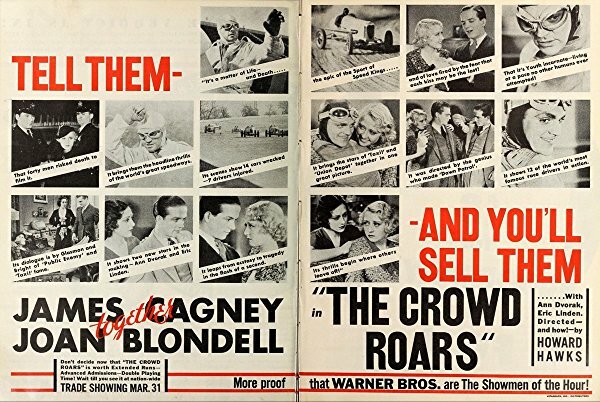 The Crowd Roars is a 1932 film starring James Cagney, Joan Blondell, Ann Dvorak, Eric Linden, Guy Kibbee and Frank McHugh and directed by Howard Hawks. Joe Greer (James Cagney) is a champion racing driver who competes in an exhibition race. While in town for the race, he mentors his brother Eddie (Eric Linden). However, their relationship deteriorates after Joe's mentoring causes him to lose his relationship with Anne Scott (Joan Blondell), as Joe told Eddie that women would be a distraction. Also because of this, Joe becomes estranged from his girlfriend, Lee Merrick (Ann Dvorak). The film was remade in 1939 as Indianapolis Speedway with McHugh playing the same character. As a result, footage was removed from the negative of The Crowd Roars to reuse footage of McHugh. The footage was later re-edited back into the original film. However, some footage from the remake was also included in The Crowd Roars in place of the original footage, namely cars from after 1932 being featured and appearances by racing announcers Wendell Niles, John Conte and Reid Kilpatrick, none of whom were in the original. It is likely that (considering what was done in the industry at the time) the original footage that was not included in the re-edit was destroyed. IMDb trivia page on The Crowd Roars.